Scott Snyder better be careful. At the pace he is going, he's going to run out of vampires to kill...or will he? In American Vampire, the dominant vampires are the more recently evolved American vampires (surprise, surprise), yet they are not the vampires which are most abundant. The older, traditional, vampires of European decent have been around for seemingly hundreds of years and are apparently all over the western United States. In Snyder's first 9 issues we have seen several old-school vampires bite (see what I did there) the dust at the hands of the evolved American vampires, and in the comic of the day, American Vampire #10 we see yet another traditional vampire die with a cliffhanger that suggests even more will meet their demise. It is starting to become quite clear that the west was highly populated by vampires. I'm thinking for ever 3 regular humans there is a vampire. There are a lot of movies and books that include large populations of vampires. Take the Blade movies for example: there are more vampires (which the majority seem to be henchmen) than most any form of vampire story this side of Daybreakers (in which almost the entire population on earth are vampires). Is American Vampire another story that includes a large population of vampires? If so, that's fine. I guess I just assumed that the vampire was a rare bread in Snyder's world. 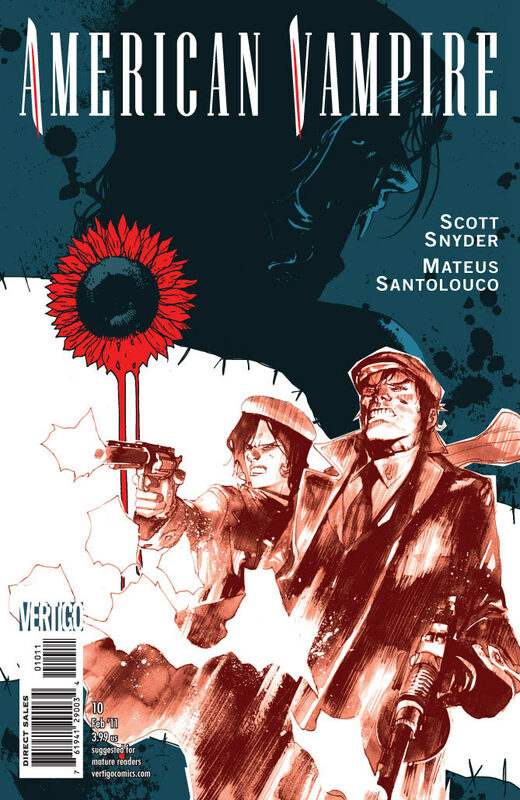 American Vampire #10 ends just as more no-name vampires are about to be dispatched. 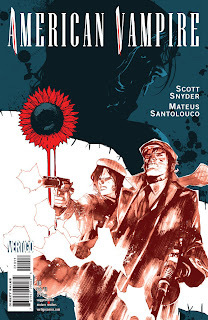 It seems funny that only 9 issues back we were just being introduced to a world with a vampire, and by American Vampire #10 we are finding out that this world has vampires to spare.